This December, our preschoolers are learning that Jesus is God’s Son! Watch this video and then take a look below at each week and the specific story your child will hear. As you scroll, you'll also see a few downloadable resources that you can use to help continue the conversation at home with your kids. Happy birthday, Jesus! Yes, we know that Christmas is all about Jesus’ birthday, but do your preschoolers know? It will be a new idea to some of them. We get to share with our preschoolers that Christmas is all about Jesus’ birthday! Jesus has a birthday? Yep! He sure does! And, we are going to celebrate it BIG! We also want our preschoolers to know that the reason we celebrate Jesus’ birthday is because Jesus is God’s Son. God’s Son deserves a celebration as big as Christmas, and a birthday bash as big as what we’re going to give Him this month! He is that special! 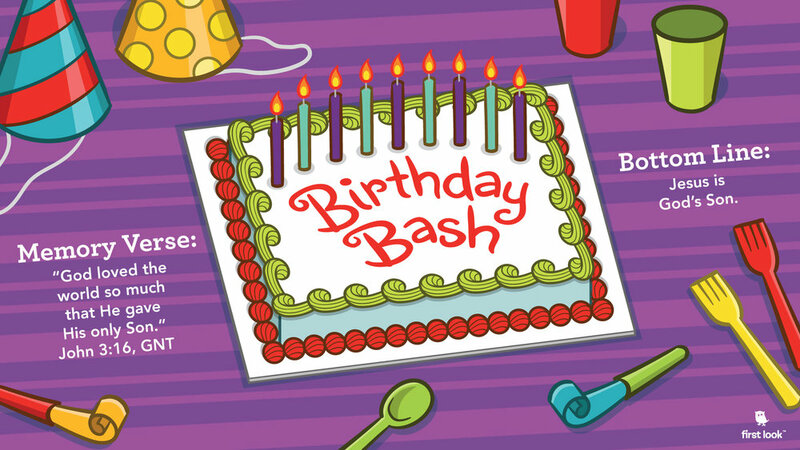 So, gather up all the birthday celebration you can and prepare to party all month long! It’s not just balloons and party hats. We are sharing the true story that God gave us His only Son, Jesus, and HE is worth celebrating!